2 How to enable automatic updates? What’s the advantage? You no longer need to plan for deploying the new versions with every release, and automatic update doesn’t require a reboot of your Azure Virtual Machines, nor does it affect on-going replication. Once you allow Site Recovery to manage updates, a global runbook (which is used by Azure services) is deployed via an automation account, which is created in the same subscription as the vault. One automation account is used for a specific vault. The runbook checks for each VM in a vault for which auto-updates are turned ON and initiates an upgrade of the Mobility Service extension if a newer version is available. The default schedule of the runbook recurs daily at 12:00 AM as per the time zone of the replicated virtual machine’s geo. The runbook schedule can also be modified via the automation account by the user, if necessary. For more details on automatic update, refer to our documentation. Cross-subscription disaster recovery for Azure virtual machines – You can now configure DR for Azure IaaS applications to a different subscription with in the same Azure Active Directory tenant. 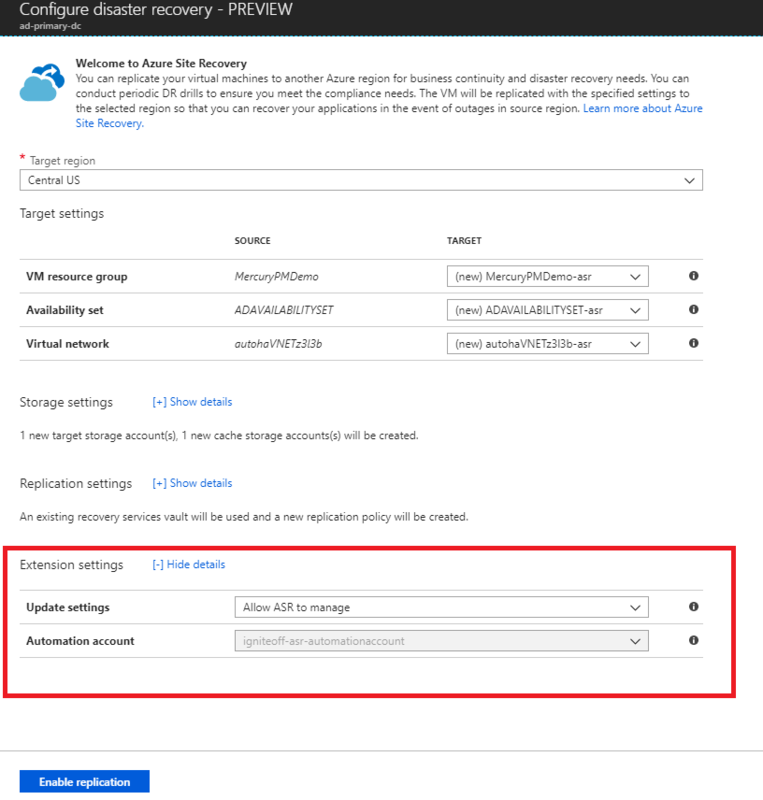 Disaster recovery for Azure Disk Encryption–enabled virtual machines – You can replicate virtual machines, enabled for encryption through the Azure Active Directory app, from one Azure region to another region.